Veterans Week 2017 will kick off Saturday, Nov. 4, with the annual Run with the Heroes 5K at Missouri Southern. 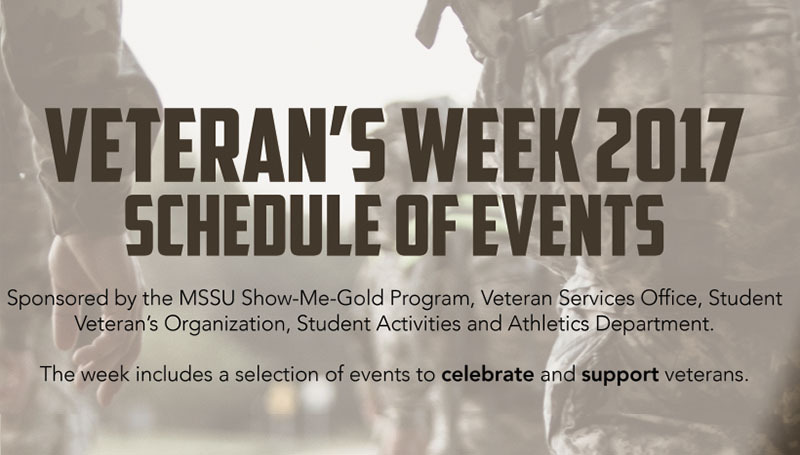 Sponsored by the Show-Me Gold officer training program, the Veteran Services Office, the Student Veterans Organization, Student Activities and the Athletics Department, the week will include a variety of events to celebrate and support veterans on campus and in the Joplin area. Run with the Heroes 5K: The race will begin at 9 a.m. in the south parking lot at 9 a.m. A 1-mile Fun Run will be offered at 8:30 a.m. To register online, visit https://localraces.com/twelveone/run-with-the-heroes-2017. Football vs. Lindenwood: 2 p.m. at Fred Hughes Stadium, Military Appreciation game. All military ID holders will have free admission. Archery Tag/Dodgeball: 10:30 a.m. to 1:30 p.m., on the Oval. “Saving Private Ryan”: 5:30 p.m., Phelps Theater. “Hacksaw Ridge”: 5:30 p.m., Phelps Theater. Veteran Appreciation Luncheon: 11:30 a.m., Connor Ballroom in Billingsly Student Center. Open to veterans from campus and the community. Military Fitness Challenge: 5:30 p.m., Fred G. Hughes Stadium. Veterans Day Ceremony: 11:3o a.m., on the Oval. Open to the public.